On June 8, 2017, at approximately 4:00 am Dallas Police Officers responded on a shooting call to 11565 Harry Hines Boulevard, which involved the victim, Cedric D. Bryant Black male/30, and another male victim. The two victims had been shot by an unknown Black male suspect. It was determined that an altercation in the parking lot preceded the victim being murdered. The second victim was treated for a gunshot wound to the arm. The suspects were last seen driving away from the crime scene in a black newer model Jaguar. The suspect on the left was wearing a large gold necklace with the word “TAY” written on it. 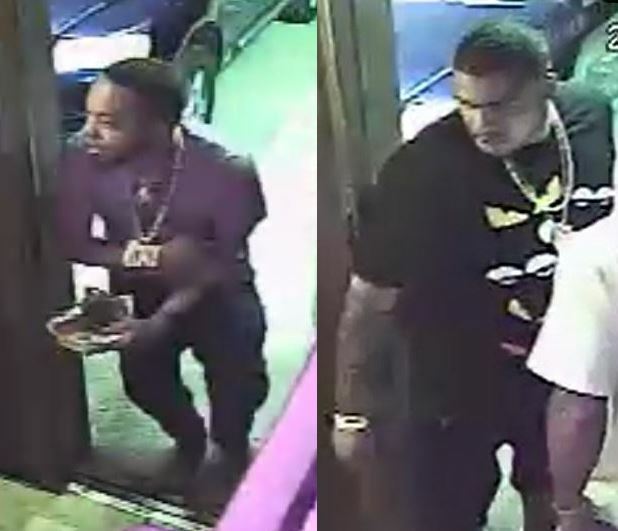 The Dallas Police Department is asking for the public’s help in identifying the subjects in the picture. Anyone with information as to the identity or whereabouts of these individuals are asked to call Detective Steven David with the Homicide Unit at 214-283-4834 or email at steven.david@dpd.ci.dallas.tx.us. The homicide is documented on case number 129096-2017.